My sister and I loved Pippy Longstocking. 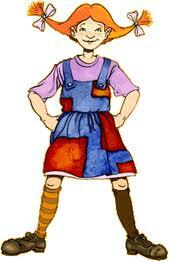 As children we emulated her - me by wearing pigtails and my sister by wearing stripey socks and tights. We thought about having a Pippi Longstocking inspired dress code this month, but without enough hair to make into pigtails we may have to settle for stripey socks or tights instead. Though this may go unnoticed with our legs hidden behind the desk so much of the time - in fact we could be wearing almost anything behind here!